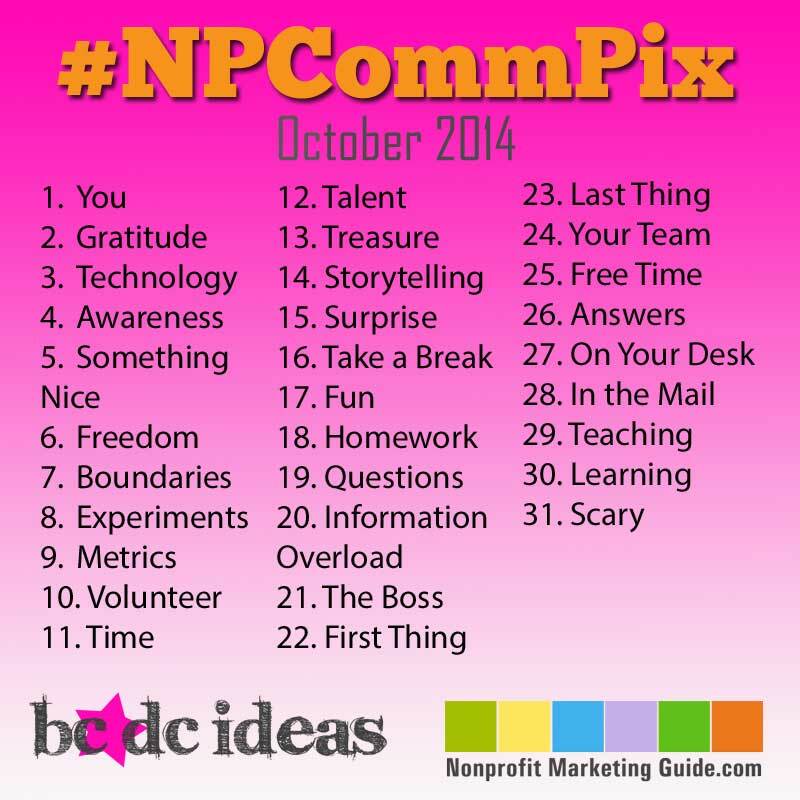 We’ve been co-hosting the #NPCommPix Photo-A-Day Challenge with The Nonprofit Marketing Guide and it’s been a smashing success! We’ll be doing a couple of posts in this series to share what we’ve learned about hosting this experimental and fun way to engage your social media audiences. A Photo-A-Day Challenge is a “game” created on Instagram and Twitter that asks individuals to post one photo a day that is inspired by a prompt or word. Some successful ones are here, here and here. For October 2014, we challenged nonprofit folks who touch communications in some way – be it full-time, part-time, REALLY part-time or volunteer-time – to participate. In the 13 days since the start of the challenge, we’ve already had more than 700 photos posted by 30 regular contributors. We’ve seen beautiful photos, touching captions, funny stuff – it really runs the gamut! Since we’re mid-stream with our promotion, it’s valuable to capture how we got this project off the ground and how our team is making it all work. Here are my top 10 tips on how to survive and thrive during a Photo-A-Day Challenge. Build a Team – It’s a lot of promotion and community engagement for just one person to create these challenges. Kivi and our BC/DC Ideas team split up making the list of photo prompts for each day and both worked on landing people to participate. Every day our BC/DC Ideas team tries to post multiple photos so we can add to the volume and remind each other of the prompt. Start Promoting Early – We launched our promotion of the Challenge on the 15th of September and posted a count down until the first day of the Challenge on October 1. This allowed our participants to sign-on by posting the challenge image or at least find out what it’s all about. Create a Simple Photo Prompt Graphic – This simple graphic is our lifeline. BC/DC Ideas created it in Photoshop Elements, and we have it printed out in the office to remind us of the prompts. Recruit, Recruit, Recruit – Kivi and the BC/DC Ideas team sent personal emails inviting our favorite nonprofit communicators to participate. We also both promoted heavily on Instagram, Twitter and Facebook. Kivi used her newsletter to promote the project. We are also NOT seeing a lot of late comers but Kivi is trying to change that. The people who started on October 1 are pretty much the same people participating now that we’re midway. We imagine this might change in later challenges, but people are not jumping on the bandwagon. Create a Tumblr to Capture Images – We’ve used IFTTT to auto-populate a blog with all the images that are hashtagged on Instagram. This permanent, free solution is a great way to share this project beyond Intstagram and to do easy evaluation. If you want to learn more about how to set-up this type of blog, I’ll be coming out with a new post soon. Appreciate, Celebrate and Repeat – Every day we purposely go through and “Like” all of the photos in the Challenge and comment on our favorites. It’s important to thank your participants. And who doesn’t like a “Like”? Highlight the Super Users – At the end of each day, BC/DC Ideas has collected our favorite photos posted that day to showcase. This is the allure of other Photo-A-Day Challenges is to be selected as one of the “Fab Four” of all the submissions for the day. We can’t narrow it down to our favorite four, so we pick all the photos we like, grab a screen grab and then use a photo collage app like Frame Magic to create daily collages of our favorites. We also do shout-outs to every one featured. Honestly, I do this on the couch right after my baby goes to bed in about 20 minutes, so it’s a labor of love, but so important for community engagement. Keep It Real + Keep Going – Our team at BC/DC Ideas have all skipped a day in participating (or many depending on the team member) and that is totally okay! This needs to be fun for your team, too. We’ve added our prompts to our Google Calendars and project management system to keep us on track. It can be hard even for super creatives to think of something to post every day. And we all get busy; don’t be hard on yourself. Just like some other photos and keep on chugging. Keep a List for the Next Challenge – We are planning on hosting the next Challenge in January 2015, once per quarter is about all we can muster. We’ve already started our list of photo prompts for the next challenge. We’re using Google Docs to create a shared document so Kivi and our team can add to it. Measure! – We’re going to take time at the end of this process to measure participation and find opportunities for improvement. We’re also going to profile a few super users at the end of the month-long challenge to see how this tactic impacted their teams and collect their tips for surviving and thriving during a Photo-A-Day Challenge. Stay tuned, y’all. We’re not done yet!